Alien: Covenant Movie Review - To "Ridley Scott" Will Soon Enter Common Usage - Are You Screening? It’s been five years since Prometheus, and while the bonkers Exodus: Gods and Kings and The Counsellor didn’t offer a lot of hope that Ridley Scott was going to improve on the sad and boring road he’d taken the Aliens universe down, The Martian did manage to ignite a spark of hope. Unfortunately, it seems The Martian had enough source material behind it, and owes its positives far more to Andy Weir, Drew Goddard, and Matt Damon. Alien: Covenant manages to redouble all the misguided efforts of Prometheus, and worse still, is even more convinced that audiences are both brain dead and have never seen any other films. We kick off with the hapless crew of the colony ship Covenant, who are en route to a well-researched planet where they plan to offload some 2,000 colonists to start a new life. 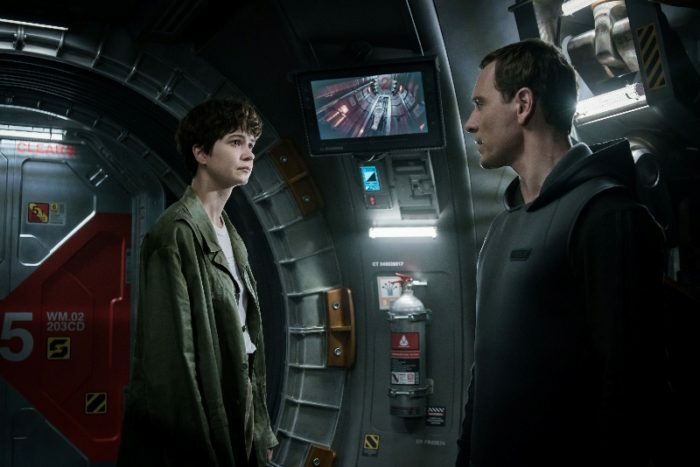 The familiar android Walter (Michael Fassbender) patrols the ship, but an unforeseeable disturbance in space causes the crew to be brought out of stasis, though the crew suffers a casualty. Now without their leader, Branson (James Franco), Oram (Billy Crudup), Daniels (Katherine Waterston), Tennessee (Danny McBride), and the rest of the alien food must figure out a way to make repairs. But, when a transmission comes through of a woman singing, they decide to check out another planet, one which curiously eluded their detection before they left. After giving the unknown planet the all-encompassing safety check of looking out the window for a few seconds, the crew begins to wander around the planet and we soon learn that they have indeed arrived on the world of Prometheus. Our heroes are armed with bedrolls and GoPros (sorry, they don’t update in the next 100 years… interstellar travel be damned), but forego masks or other environmental protections, and so we soon have aliens popping out of people. We meet David (Michael Fassbender), who has been stuck on the planet for ten years, and we learn that he’s been busy carving flutes and upgrading death toxins into a new species, because… well, no, for David’s activity to have any purpose or reasoning behind it would be a giant leap into the sensible that the film itself has no interest in. Photo Credit: Mark Rogers TM & © 2017 Twentieth Century Fox Film Corporation. You might take issue with how poorly the film is constructed, being obviously worked backward with little attention to the characters that are forced to carry us along. There is a place this film has to get to in the end, lest it make no sense as a prequel, and as long as we move toward that ending, nothing else matters. It is, by the way, the most obvious ending in film history, but is delivered as though the film actually thinks its going to surprise you. You might also find fault with the fact that everything about the plot is predicated on the idea that the crew are all morons. In order to get through the film’s stages, you have to assume that there was virtually no training necessary to qualify for this crew, nor even a High School diploma. Oram, our newly minted leader, isn’t even clever enough to avoid the old “Hey, stick your head in this,” routine. You might even fault the film for its distractingly unrealistic dialog, or the massive time it spends on off-putting, condescending philosophic babble. Depending on your particular take on the franchise, horror films, and/or movies generally, none of that may really matter in the face of the fact that the thing is just mind-numbingly boring. It’s gorgeous, in its own way, but putting these actors, this world, and this budget together to create something that actually rivals the worst films ever for pure tedium is a feat of its own. You couldn’t do it if you tried. The film doesn’t even give you the slightest connection to anyone involved because it only wants you to know them in terms of their stupidity. Once they start falling victim to the aliens, your only potential interest comes by way of rooting for a new and exciting version of gory death. Even that wouldn’t quite be the complete kiss of death, except that Scott clearly believes he’s working together an opus on the human condition here, and audiences are all meant to achieve enlightenment once he’s finished having his say at them. It isn’t even clear if Scott is more afraid of A.I., or is chiefly interested in a wool-gathering session on how “we did it to ourselves,” and since this is as uninteresting to ferret through as Hegel, it’s doubtful anyone will bother trying to piece it together. Either way, it’s becoming more and more difficult to convince a new generation that there was ever a reason to be interested in Scott’s films. Mystery Science Theater 3000 fans, however, have much to look forward to.